Although decorative concrete used in public works projects almost always serves a practical purpose, it also often qualifies as art. 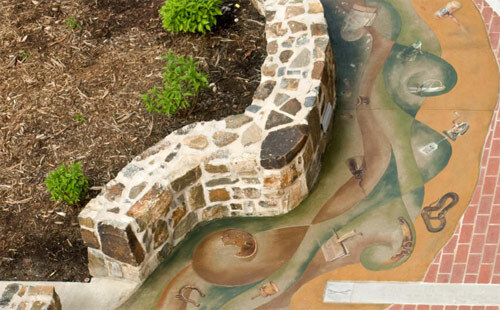 This art can range from the typical retaining wall or sidewalk to elaborate murals. Concrete Decor has talked to five artisans to showcase the variety of public works projects available to contractors. 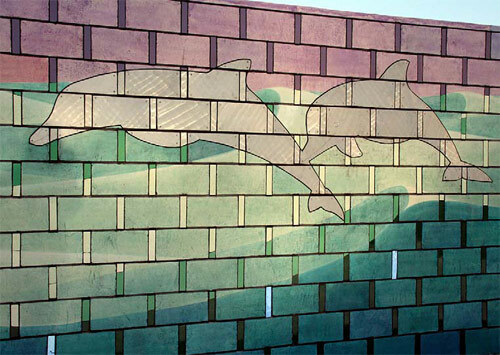 Concrete artisan and Southern Arkansas University art professor Steven Ochs recently had the opportunity to create a public art project depicting the Arkansas River and the state's history. With a crew of 11 and help and input from many others, the end result was a unique 200-foot long walking mural on the main campus of the Central Arkansas Library System in Little Rock, Ark. Flowing along a sidewalk, the concrete river is designed to scale, accurately showing every bend and turn of the river's presence in the state. Ochs worked with more than 20 museum directors from across Arkansas, having them select artifacts that would be drawn into the project to help tell the story of Arkansas' people and the importance of the river. "The objects that are represented in that river are not my choice at all," he says. "I wanted to leave it up to those who know their history." The 110 chosen items ranged in age from 8,000 years old to 80 years old, highlighting the lives of Arkansas' indigenous population, Indian tribes, and early pioneers and settlers. "It's a pretty good cross-representation," Ochs says. Ochs put together a team of eight local artists, ranging from high school students to professional artists, to replicate the artifacts as well as 46 types of aquatic life found in the river. Each artist was given a full-color 8-inch by 10-inch photograph of an artifact to reproduce on concrete using water-based stains from Smith Paint Products. The artifacts are designed to look like they are actually underneath the flowing river. This was done by coloring some parts of each image in detail, while fading other parts to look as though they are underneath water. "They are very interesting aesthetically," Ochs says. "They create a lot of mystery. People look at them and want to know what they are." The cut lines and texture of the "current" also aid in this effect. To enhance the illusion of the river, the concrete was broomed in one direction to represent flowing water, and Ochs' partner, Gerald Taylor, scored in the curved lines. In all, the process took almost 4 years to complete after Ochs proposed the idea to library director Bobby Roberts in November 2005. There was plenty of research, travel, and meeting with architects. "One of the most challenging aspects of public art is maintaining a momentum of excitement through the long process," Ochs says. Clearly all that time didn't hurt Ochs, as he was able to create a truly unique piece of public art. He says that this is the largest and most complicated public art project he has created with decorative concrete to date. Photos courtesy of Colorado Hardscapes Inc. When OZ Architecture and general contractor FCI Constructors Inc. were hired to construct a building to house Colorado Mountain College's presence in Breckenridge, Colo., they knew they wanted to incorporate decorative concrete into the project. Their initial vision for the lobby floor was a simple grind followed by a Bomanite stain-and-seal finish, but Colorado Hardscapes Inc. of Denver, Colo., proposed a more elaborate concept, involving polished concrete with decorative radial saw cuts and caulking, says business developer Karen Van Heukelem, LEED AP, of Colorado Hardscapes. Working in the lobby as well as on a staircase, Colorado Hardscapes used Bomanite's Patene Teres polishing system in conjunction with Bomanite's Ebony and Auburn stain colors. V cuts were made for aesthetic appeal and caulked to visually enhance the straight and radial saw cuts. To obtain the job, Colorado Hardscapes submitted a bid to FCI. They showed the general contractor several photos of similar projects and completed two samples on-site before they were given the contract. According to Van Heukelem, working with FCI was the best part of the project because of its attention to detail. "Before we came in they had torn up the floor twice because it wasn't up to their standards," she says. Given a large project and a small budget, Dakota Warren of Los Angeles knew that concrete was the way to go. Warren was commissioned by the Los Angeles County Arts Commission to create a mural for the Mona Park swimming pool in Compton, Calif., on a wall that spanned 120 feet long and 8 feet high. Warren was given the job after the Arts Commission contacted him and encouraging him to apply for the project. They remembered his work from a previous bid he entered, and felt he would likely be a good match for the mural job. "They weren't quite sure what to do with this wall," Warren says. Although he does many of his murals with ceramic tiles, he felt that concrete would lend a more classic appeal to this project. "It gives it a really nice effect," he says of the concrete. "It worked out perfectly." The original wall was constructed out of cinder blocks, so the first step was to resurface it with Surecrete Wall Spray using a hopper and trowel it back. Warren stained the wall using Deso Dyes from Colormaker Floors. Pieces of ceramic, aluminum and glass were planted into recesses in the wall after the concrete had cured. Working through the unseasonably hot summer temperatures was a challenge for Warren, as was keeping the project at a low cost. "Because it was a really big wall and the budget wasn't huge, I basically did the entire thing by myself," he says. Photo courtesy of Hunt Valley Contractors Inc. Contractor: Hunt Valley Contractors Inc. When the Maryland State Highway Administration contacted Hunt Valley Contractors Inc. president Tom Sparks to construct a sign for a newly dedicated section of Interstate 70, he viewed it as a great way to give back to the community. 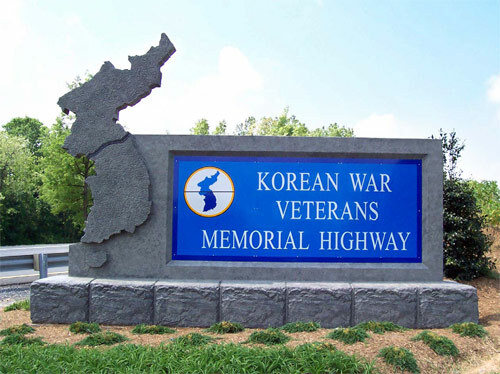 The 40-mile stretch of freeway is now known as the Korean War Veterans Memorial Highway, with a sign from Hunt Valley marking it at each end. A veteran himself, Sparks worked with the highway administration and a Korean War veterans group in Frederick County to come up with a design and plan for the marker. "We worked with them very closely on the engineering and constructability of it," he says. Each sign is approximately 8 feet tall, 16 feet wide and 12 inches thick. The base of each sign is constructed out of cast-in-place concrete, while the rest was done with precast. The combination was done to help keep the overall weight to a minimum. "We wanted to be able to lift it and move it around with a reasonable-sized crane," Sparks says. The shape of Korea was created using a styrofoam cutout of the country. The South Korea portion was poured directly to the sign, while the North half was poured separately and attached with a metal plate. In order to keep costs down, Sparks says, several local companies donated time and materials to the project. Sparks subbed out the concrete base to McGuire Inc. of Baltimore, and Back River Supply Inc. of Maryland poured the actual sign. "A lot of things were donated," he says. "It was all in the spirit of giving back something to the community, especially the veterans." When U.S. 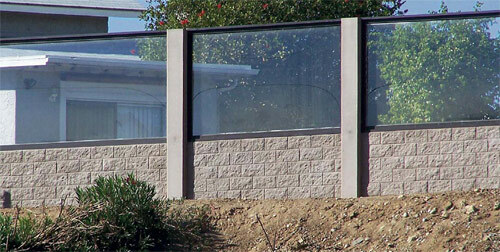 Concrete Precast Group was hired to develop sound-dampening concrete wall panels alongside California Route 125, the original plan was to create texture on only one side of the 4-by-8 panels. However, a decision was made to have texture on both sides of the panels after the molds were created. Instead of redoing the molds, U.S. Precast called on Donnie Vachon of New Images Concrete Construction to stamp the plain side of every one of the 126 panels. And with a background in the precast industry, he was just the guy for it. 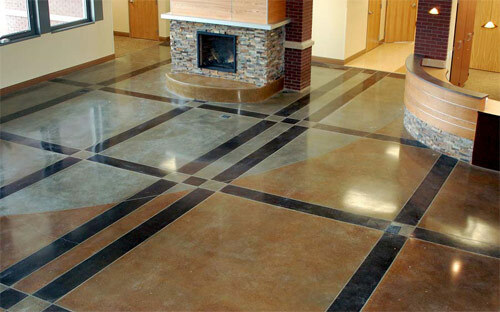 Because the pattern on one side of the panels needed to match the other side, Vachon contacted Proline Concrete Tools. Together, they were able to create a set of stamps that produced a pattern identical to the original. The team also had to engineer a new liquid stamp release. The form liners in each piece kept bleed water from escaping into soil, so the water had to come out of the top. That made stamping difficult. Trials were done with existing stamp releases, but they didn't cut it, and a special mix needed to be created. Waiting for the bleed water to escape from the top of each panel also affected the stamping process, Vachon says. "Timing was a whole lot more critical. You had to wait for that to happen, and once it was out, boom, it was ready to go." Vachon says that he would often wait around 5 or 6 hours for bleed water to come out, and then only have 15 minutes to stamp a set of 5 panels. When there are more than a hundred panels, this is tough.